SavannahPremium - a registered TICA (The International Cat Association) cattery, which has been breeding pets, exotic appearance - hybrid cat breed Savannah. 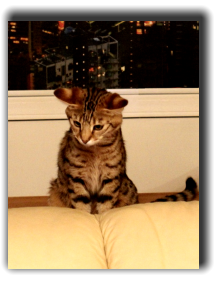 The cattery SavannahPremium is in Russian Federation, Saint-Petersburg. 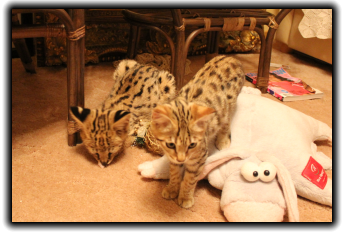 The purpose of breeding is to create a large, graceful cat with stunningly elegant body shape, exotic wild color, intellectual development and the smartest of African Serval, but with a sweet temper domestic cat, adapted to contain at home. More information about the features of breed Savannah you may find here. We breed Savannah cats, because love them very much, and they are the most special, intelligent, loyal, affectionate and most beautiful for us. All cats live at home, and so completely socialized. 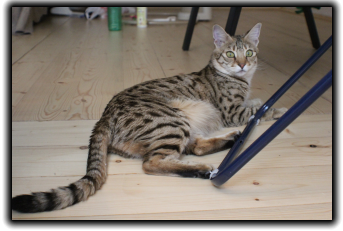 We are very happy to get involve in the program on breeding Savannah cats and, to drop our little contribution to this unique and wonderful catbreed - Savannah. Every kitten in our cattery is beeing growning with our love, socialized and adapted for new home. Every kitten knows everything about his toilet. Our kittens don't fear of children to play with them. - Tica documents, confirming ancestry. We can transported kittens to other cities and states. SavannahPremium cattery does'nt amputation operations claws cats, because it is unnatural and not humane.